Acme Observatory - A concert series presenting bi-weekly events of new music by 20th and 21st century composers and performers. Art & Soul Oakland - Features live jazz, rock, gospel, E.D.M., punk, honky-tonk, metal, world, Latin, folk, R&B, and blues music performed by national recording artists and top local talent. Asian Improv - Dedicated to the cultivation, presentation, and documentation of the Asian American experience. Audium - Pioneering the exploration of space in music. The theatre's 169 speakers bathe listeners in sounds that move past, over, and under them. "Sound sculptures" are performed in darkness in the 49-seat theatre. Berkeley Arts Festival - Ongoing concert series, now in residence at now in residence at 2133 University Avenue, Berkeley, California. Berkeley Bluegrass Festival - At Freight & Salvage. Berkeley Festival and Exhibition - Eight days of concerts, lectures, masterclasses, meetings, films, and festivities. Berkeley World Music Festival - Visitors are treated to a world music tour in a variety of Telegraph Avenue Venues, near UC Berkeley, from intimate café and street music to a concert at the YWCA gym and evening dance parties. Bimbo's - Events and concerts listings: 365 Club 1025 Columbus Ave., at Chestnut in North Beach (SF). Black and White Ball - Every two years, some 15,000 people gather in the heart of San Francisco for a night of revelry that features multiple stages and dozens of top bands and performers. BottleRock - Napa Valley music festival. Burger Boogaloo - In Oakland's Mosswood Park on Fourth of July weekend. A sweaty tribute to trashy (in the best way) power pop and garage rock organized by Total Trash Productions and Southern California music label Burger Records. Celtic and Music Arts Festival - Presented by the Irish Arts Foundation. Creative Musical Alternatives - Hosts over 70 shows per year. Croatian American Cultural Center Calendar of Events - A center to share the rich cultural heritage Croatia, the Center has become an important gathering place for enthusiasts of Croatia and other Slavic music and dance, and recent immigrants as well as long time members. Death Guild - Goth Monday nights at the Glas Kat. First City Festival - Monterrey County Fair in August, 30+ bands in a relaxed and beautiful coastal setting. Flower Piano - A special 12–day long community event in July, where 12 pianos are placed at dramatic, picturesque locations throughout the San Francisco Botanical Garden's 55 acres for anyone to play. Freight and Salvage - Events and concerts listings: 1111 Addison St., Berkeley. Gilman Street Project - The 924 Gilman Street Project a.k.a the 'Alternative Music Foundation', is an all-ages, non-profit, collectively organized music and performance venue. We do shows on Fridays, Saturdays, and occasionally on Sundays. It is located in North Berkeley, about 1 1/2 miles from the North Berkeley BART station, at the corner of 8th St. and Gilman. Golden Gate Blues Society - A nonprofit affiliate of The Blues Foundation, based in Memphis, Tennessee. Sponsors and supports blues performances in the Greater Bay Area Blues community. See Events. Golden Gate Park Band - Concerts every Sunday April through October in Golden Gate Park: classical, marches, opera, Broadway shows, swing, ethnic programs. Hardly Strictly Bluegrass - Investment banker Warren Hellman's annual clambake. The heart of the festival remains the traditional folk and bluegrass musicians who appear on the Banjo Stage at Speedway Meadow in Golden Gate Park. Hiero Day - Oakland music festival. Continuous entertainment from Hip-Hop, Jazz, Electronic, Alternative and R&B. Herbst Theater - Events and concerts listings: Located inside the War Memorial Veterans Building at 401 Van Ness Avenue. Hickey Fest - Three hours north of the city in mid-June. You can camp in the redwood forest alongside Mendocino's Eel River. Expect to split your time watching indie rock bands at the Peg House's outdoor patio (which hosts the festival and serves cheap pitchers of IPA along with delicious food) and sunbathing by river. Organized by local artist Ash Reiter. ID10T Festival + Comic Convivial - A celebration of music, comics, gaming, comedy, technology, and all things pop culture. Shoreline Amphitheatre, Silicon Valley. Jazz Heritage Center - Part jazz museum, part jazz cultural center, and part jazz art gallery. See News and Events page. La Pena Cultural Center - Events and concerts listings: 3105 Shattuck Avenue, Berkeley. Ladyfest Bay Area - Grassroots arts & music festival that gives back to its community. Luggage Store Gallery New Music Series - Luggage Store Gallery - Programs are dedicated to broadening social and aesthetic networks, by encouraging the flow of image and ideas between different cultural and economic communities. Three venues, 1007 Market Street, 509 Ellis Street and Cohen Alley. Monthly exhibitions, weekly Tuesday comedy open mike/workshop, weekly Thursday Creative Music, experimental, improvisation and electronic; and other events. Mendocino Music Festival - Opera, big band, chamber music, blues, and world music. Meridian Gallery: Concerts - This concert series celebrates new, traditional and world music through monthly performances. The concerts take place on the first Friday of every month, in the intimate setting of Meridian Gallery. Monterey Jazz Festival - The longest running jazz festival in the world and one of the world's most respected. Noe Valley Music Series - Located at The Noe Valley Ministry, 1021 Sanchez St @ 23rd (SF), an intimate and acoustically ideal 110 year old Victorian church in the picturesque Noe Valley neighborhood of San Francisco, the series has garnered praise for its programming of nationally and internationally known musicians (many who've won Grammys, Guggenheim Fellowships and other awards) and Bay Area performers of the highest quality. Over the last 16 years the series featured the first concert hall performances of: Bobby McFerrin, Voicestra, Turtle Island String Quartet, The Modern Mandolin Quartet, Trance Mission and The Bobs. Noise Pop - The Noise Pop Music & Arts Festival is a San Francisco staple, featuring 11 days, 160+ bands, 85+ events, 25+ venues. Noontime Concerts - Begun in Old St. Mary's Cathedral, at the crossroads of the Financial District and Chinatown, the series' mission is to enrich the cultural life of San Francisco and the Bay Area. Performed by professional local and international touring artists, the concerts are not ticketed, but free-will donations are solicited so everyone can enjoy the music regardless of ability to pay. Low-cost, live musical performances are offered at a time convenient for downtown workers, visitors, students, shoppers, and music lovers. Oakland Music Festival - Showcases local and international musical talent as well as local eateries, breweries and small craft distillers. Old First Concerts - Known since 1970 for innovative programming and high quality performances, Old First offers a congenial setting to hear music ranging from chamber and choral to jazz and world - all at affordable prices. Conveniently located in San Francisco's mid-town district, most performances are Friday evenings and Sunday afternoons. Organ Concerts - Every Saturday and Sunday 4:00 p.m. at the Legion of Honor art museum. Other Minds - New and unusual music in all its forms. 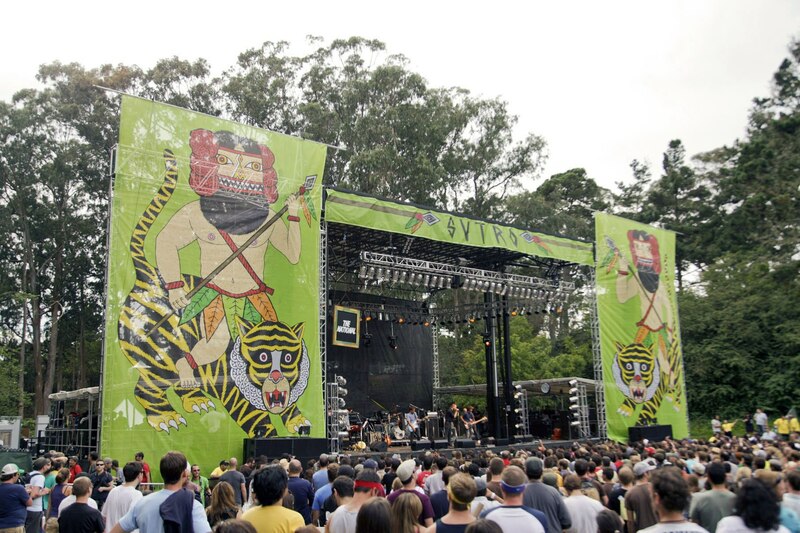 Outside Lands Music and Arts Festival - Rock concert designed to utilize several strategies of being eco-friendly, as well as to educate the public about eco-friendly movements. There are solar power stages, a refillable water program, a waste diversion program, a recycling program, and bike valet parking program. There have also been workshops to educate about organic food and farming. Outside Lands also features attractions that focus around food, wine, and art. Outsound New Music Summit - Features some of the most innovative, pioneering, experimental, and independent sonic exploration happening in California and beyond. usually held in July outdoors and indoors at the Oakland Metro Theater in Oakland. Palace of Fine Arts - Events and concerts listings: 3301 Lyon St., SF Box Office: 415 563-6504. Paramount Theatre - Events and concerts listings: 2025 Broadway (Oakland). Phono del Sol Music Festival - Strives to put favorite local SF acts on the same stage as nationally renowned artists in sunny Potrero Del Sol, a little-known park on the southeastern edge of San Francisco's Mission District. A production of The Bay Bridged and presented with Tiny Telephone. Red Poppy Art House - Events and concerts listings: 2698 Folsom St., at 23rd (SF) 415 826-2402. Saint John Coltrane Church - Founders Archbishop Franzo King and Reverend Mother Marina King began this work in 1971 under the name of One Mind Temple Evolutionary Transitional Body of Christ. The inspiration came after the young couple had seen John Coltrane perform live in San Francisco in the year 1965. Being raised in the Pentecostal Church, Franzo King knew the presence of the Lord when it came through the power of the Holy Ghost. Seeing John Coltrane and hearing his sound that night was that familiar feeling he knew since childhood. It was the presence of God. Archbishop King refers to this as a "sound baptism" which touched their hearts and minds. Further investigation into this man proved him to be not just a "jazz musician" but one who was chosen to guide souls back to God. The centrepiece of the "Coltrane liturgy" is his 1964 album, A Love Supreme, what the church calls his "testimony ". As the band goes into Acknowledgement, the first part of A Love Supreme, the choir sings the words to Psalm 23. When they reach the part where, on the album, Coltrane chants the words A Love Supreme over and over like a mantra, Archbishop King walks among the congregation with a microphone. "Let's have some love!" he yells. "Don't just take it! Give!" San Francisco Alt Music Festival - Promoting the New Music scene in Oakland, San Francisco, and throughout the Bay Area, including -Garde Jazz, Free Improvisation, Creative Music, New Classical, Experimental, Computer/Electronic, and Noise. San Francisco Bluegrass & Old-Time Festival - Bluegrass and old-time music. San Francisco Blues Festival - Longest running blues festival (since 1973), canceled in 2009. San Francisco City Chorus (SFCC) - Dedicated to providing exciting and affordable musical performances to Bay Area residents, choral music lovers, singers and audiences. SFCC has about 65 members and performs three concerts each year. Its Christmas caroling throughout the city is a San Francisco tradition. San Francisco Electronic Music Festival - New electronic music and sound art. Designed as an annual multi-day event consisting of concerts, installations and discussions, the primary focus is on independent artists whose innovative aesthetics challenge academic and commercial standards. San Francisco Free Folk Festival - Nationally and internationally acclaimed performers, as well as gifted local musicians, singers, dancers and storytellers, will offer concerts and workshops throughout the festival. San Francisco Jazz Organization (SFJAZZ) - A not-for-profit organization dedicated to preserving the traditions and encouraging the growth of jazz through presentation and education in the San Francisco Bay Area. SFJAZZ is the presenter of the annual San Francisco Jazz Festival, the SFJAZZ Spring Season, and multiple series of free outdoor concerts from June through October. See Events Calendar. San Francisco Mixedtape Society - A monthly event dedicated to the friendly art of making and exchanging music mixes. Everyone is invited to assemble a mix tape, mix CD or mix USB stick according to the theme. The mixes are traded over the course of the evening through a spirited raffle. The best mixtapes, as selected by the audience and by judges, win prizes. The Mixtape Society is free to attend and open to the public. San Francisco Performances - Founded in 1979, San Francisco Performances is the Bay Area's leading independent presenter of chamber music, vocal and instrumental recitals, jazz and contemporary dance. Under the artistic direction of its founder, Ruth Felt, the organization presents internationally acclaimed and emerging performing artists, introduces innovative programs, and builds new and diversified audiences for the arts through education and outreach activities that also strengthen the local performing arts community. San Francisco Popfest - In May, showcasing over a dozen indie pop and rock bands. Various venues. San Francisco Tape Music Festival - Classic and contemporary fixed media compositions. San Francisco World Music Festival - This annual event which brings together musicians from all over the world to the San Francisco Bay Area. San Jose Jazz Summer Fest - Over 100 shows on 13 stages of jazz, Latin, blues, R&B, world, New Orleans & more. In August, annually. Silicon Valley Contemporary - Showcasing important artworks of the 20th and 21st centuries in collaboration with a carefully selected group of 80 international art galleries. Stanford Jazz Festival - The Stanford Jazz Workshop's Summer Festival traditionally ranks among the best. Static Illusion Methodical Madness Music Series (SIMM) - A musician run bi-monthly music performance series bringing highly professional and truly adventurous music that would not normally be heard or supported by mainstream society. Stern Grove Festival - The oldest admission-free summer performing arts festival of its kind in America. A continuous and much beloved Bay Area tradition for seven decades, each summer nearly 100,000 music and nature lovers gather at Sigmund Stern Grove Park to enjoy live Sunday afternoon concerts, picnicking, and relaxation in a serene and majestic natural amphitheater surrounded by giant eucalyptus, redwood and fir trees. Treasure Island Music Festival - An annual two day music festival that takes place on Treasure Island, California, located in the San Francisco Bay. The festival is produced by Noise Pop and the Another Planet Entertainment (APE). The first day of the festival consists of Electronica and Hip Hop/Rap influenced performers while the second day consists of Rock and Indie rock influenced performers. Each day the sets are split between two separate, nearby stages, however the performances are staggered such that attendees can listen to every performer. Typically, the northernmost stage is the main stage on which the headliner plays. See Wikipedia article. Trinity Chamber Concerts - Presenting solo and small ensemble works from ancient to modern by Bay Area performers. Woodsist Festival - Big Sur in August for 2 days of wandering, nostalgic folk rock. Yoshi's Oakland (Jack London Square) - Events and concerts listings: 510 Embarcadero West between Washington and Clay Streets around the corner from the Jack London Square Cinema Complex on Washington. Yoshi's San Francisco - Events and concerts listings: 1330 Fillmore at Eddy on ground floor of Fillmore Heritage Center. This webpage last updated on Thursday, September 7, 2017 5:17 PM.